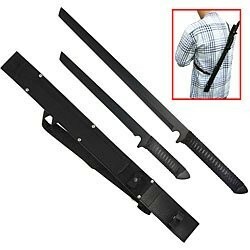 One sheath of strong nylon fabric holds both swords and can be conveniently slung over the back. Unlike some ninja weapon sets, the sheath holds no surprises other than the swords themselves, which are all business. Shaped from solid bars of 420 high carbon stainless steel, the swords are completely black anodized to prevent telltale reflection. The full tangs provide handle and bolster with a simple grip formed from a wrap of woven black nylon. The thin profile of that grip allows both swords to fit neatly in the single sheath. These single-edged swords are ground but not accurately sharpened. If you intend to use them for cutting practice, you'll need to do the finishing work yourself and hone them to a razor edge. This grade of steel actually isn't recommended for cutting, and the blades could be damaged. If you want to preserve the dark finish, don't hone the edge -- sharpening will remove the black anodizing. One large blade 26-1/4 inches long packs a cutting edge of 16-3/4 inches, while the smaller blade is 18 inches in overall length with an 11-inch blade. Together, they make a formidable pair of weapons, and if used to practice martial movements do present a real danger to onlookers and even yourself if mistakes are made. See the General Edge Twin Ninja Fighting Swords for a different approach to the double weapon concept.